Contact Penelope directly to arrange individual lessons. I trained in London from 1986 to 1989, then studied with Miss Margaret Goldie, then 86, who had worked alongside Alexander for thirty years, and was probably the closest person to him. She completely revolutionised my understanding of the technique, and I now teach her understanding to beginners, and also to Alexander technique teachers internationally. 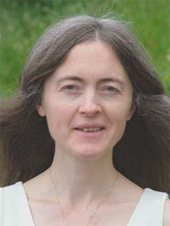 I and my husband moved to Sheffield in 1991, where I ran a Natural Health Centre, alongside my busy teaching practice. We moved to County Clare in May 2005. The Alexander technique has transformed my life, and has the capacity to transform yours. I work with all people and all sorts of problems. I have particular expertise in several areas: stringed instrument playing (I play violin, guitar, piano & also sing classical & folk); with pregnancy and childbirth; and with equestrians. I was a dancer. Within the Alexander work I also work with emotional problems of all types, for which I also use Rainbow Reiki methods for fast identification & clearing of emotional problems & blocks. I also have a nutrition training (dip. ION) & so can combine nutritional advice where appropriate.